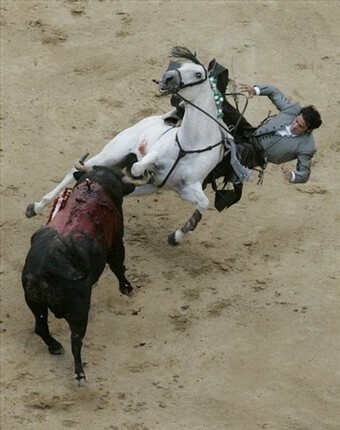 We are probably all familiar with the ancient blood ‘sport’ of Bullfighting throughout Spain and Portugal. But are you aware that France is still hosting these barbaric spectacles in 11 different departments across Southern France? Whilst the often tragic end to the bull is apparent, what is also extremely concerning to us who have a love of horses, is the countless injuries and deaths that are sustained to these brave horses during these events. In France these are called ‘La corrida à cheval’. Why is this entertainment still in existence in France and why is the French government funding it? Did you know that there are schools here that train young bullfighters from the age of 9 yrs old, again subsidised by the French authorities using taxpayers money. How can any human being claim to love horses and then subject them to this deliberate cruelty? Please can you tell me how I can help to stop this brutality. I am fortunate enough to own 2 wonderful Iberian horses – they are such gentle and sensitive creatures. Please can you tell me if any other organisations such as ILPH are involved in trying to stop this? Surely the majority of spectators are Catholic – do they suppose Jesus would approve of bullfighting?